← Nice relaxing day in Cancun! Ferry trip back to Isla Mujeres! We had another great day trip to Isla Mujeres today. We took the ferry this time and had the whole day to spend on the island. We rented a golf cart, loaded on our cooler and beach stuff, and we were off to see the sights! First stop was a turtle farm with an aquarium, where we saw more neat sea creatures. Of course I am loving all the sea creatures, even though I much prefer to see them out on the water when I am paddling. There was a white turtle there, which I had never seen before, so that was pretty exciting, and also a green sea turtle. At the turtle farm, they raise the little turtles until they are big enough to release them into the sea. In the aquarium they had a moray eel, crabs, lobsters, lion fish, octopus, sting rays, sea stars, sea anenomes, fish, and sea horses! It only cost 30 pesos to get in and I think it was a good deal. We circled the island in our golf cart until we ended up back in the little town, and stopped at a brightly colored cafe called “Manana” for lunch. It was cute with a little book store in it too. After lunch we drove to North Beach and spent the afternoon there. I was thrilled to swim until I couldn’t swim anymore! And I didn’t want to get out since the water was so warm, clear and a beautiful color of turquoise. The ferry ride back was it’s own adventure, with the windy and choppy conditions out on the sea bumping us up and down on the waves! Tomorrow is another trip to an Eco park called “Xplor”, so stay tuned for my next report. Adios! 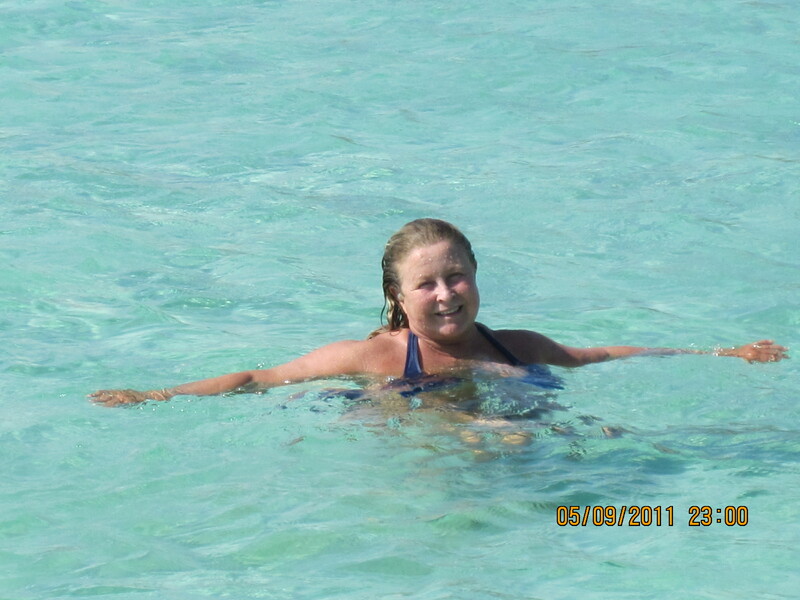 Here I am enjoying that great turquoise sea! 2 Responses to Ferry trip back to Isla Mujeres! you sure know how to have fun, girl! When you comin home???? Oh we are home now. I hope to paddle tomorrow. I have to admit I am missing that bright, white sand and turquoise hued Caribbean Sea! It was amazingly beautiful and I just kept visualizing all the great spots that I could be paddling!